floral designer paper showing thru.... I like the idea of it! tree & bulbs on the deer, just to add some sparkle! I really like how mine turned out! This is just freaking adorable!!! Super super cute!! Such a cute Christmas card! An adorable one to add to your collection! Another cute holiday card! Hope you are having a good week. 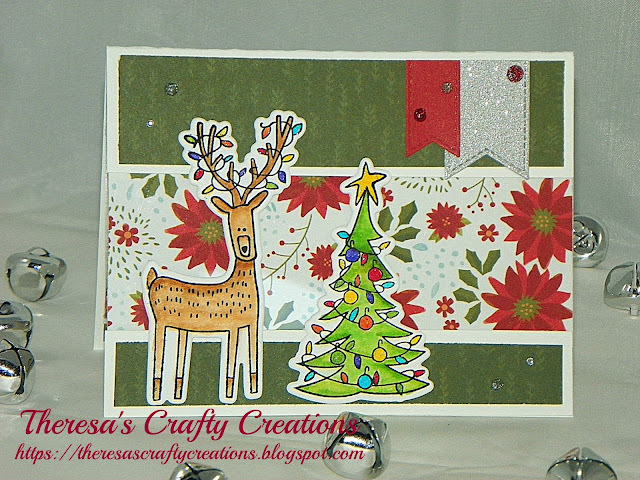 Such a very festive and cute card for the holiday season! Love that adorable reindeer! I like how it turned out, too! Really adorable. And now you have a leftover tree to use on another card! Really nice holiday card Theresa...I really like how you changed it up! Too darn cute my friend!! I think the reindeer is ADORABLE! Love all of your holiday cards! What a adorable card!! 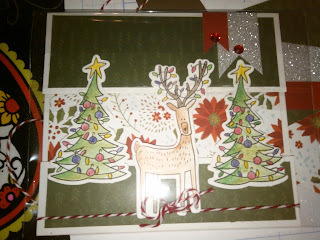 Love the cute reindeer image you used!!! Have a great day. Love your version! I have a hard time working with a kit...it pains me to think that my card is just like anyone else's so I'd have to create a new one too...adorable! Another beauty here. I again think yours is better. Cute, fun and sure made me smile. Very cute! and I love the beautifully decorated inside! !